This year's meal has proved the best the LundeRoys have ever made and we did partially homemade, partially store-bought. Here are the details. 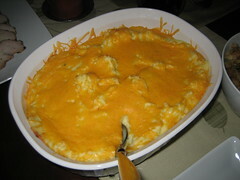 Mashed potatoes (masher in storage, had to go to a few stores to find one on Thanksgiving), best ever because they included butter, cream cheese, sour cream, ranch dressing mix, and sharp cheddar. Very healthy. 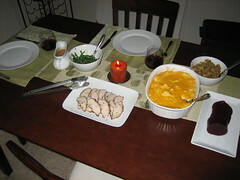 Not pictured include the gravy (jarred) and the pumpkin pie (shoulda made our own, store bought was just so-so). We had Beaujolais Nouveau with dinner and Sauvignon Blanc after. It was really tasty and we basically spent the entire meal groaning with satisfaction or saying "these are the best potatoes ever!" As I mentioned in an earlier post, we decided to get the delicious smoked and seasoned turkey from a bbq place right across the street from our apartment. We stopped in and the line was incredibly long; we decided people didn't want to cook on Thanksgiving Eve and wanted to have bbq before the turkey dinner. We came back a little later, foolishly thinking it would all be just fine. The line was still long and a bright yellow "sold out" sign was covering the turkey listing, nooooo! It was then 20 minutes until closing and we called other locations to see if they had more. We jumped back in the car and took off, fighting the clock as the drive was going to be about 20 minutes. Then there was a detour! Then a toll road! We had no cash at all so Austin dug coins out of the cupholder with just enough to throw into the hopper at the unmanned "exact coins only" station. We finally arrived and pulled into the parking lot; it was busy but the restaurant was still open. We ran in and found another long line but the turkey was still up on the menu. We made it through the line and finally procurred our sweet, sweet two pounds of turkey. Thanksgiving is safe and we have the finest turkey in all of Texas. We are now slumped in front of the tv/laptop and relaxing with Mr. Stinky who only raised an eyebrown when we explained what had happened then quickly resumed sleeping. All's well that ends well. We have the house and I finished my school projects (until finals week) so last night we were able to toast to our new abode and get a few steps closer to a move date. We went to the house to measure for our sectional couch and brought our first load of STUFF along with us (every time we go, we're filling up the car). Then, using an elaborate system of string and tape, we marked out exactly what pieces would fit and where they would go; this is because Austin is analytical and I have no spatial skills so I had to physically see the dimensions. We called it String Theory and it worked out well. After working this all out, Austin wanted to visit the couch at Crate and Barrel but we ended up ordering because prices are going up soon and one piece won't come in until sometime in 2009! Our sectional won't be an L shape to start with but just a nice long couch, not a big deal at all. This will be delivered on December 12. Now we have to score a fridge in order to make the house workable and, sadly, may have to pull the trigger on Black Friday. We are both opposed to shopping on this day but you gotta do what you gotta do sometimes. The fridge is top priority but the washer and dryer might also be obtained soon if we decide to venture out in the wee hours of Friday. It's coming together and we're going to pick up paint tonight so we can spend part of tomorrow painting some sample patches to finalize a color. So far every chip we've picked up that looked sage turned into a frightening sea foam green when actually in the house. We're looking forward to the long weekend so we can relax a little and start personalizing our house. We came, we signed, we closed. It all worked out and we couldn't be more excited. Details to come soon but first some important school projects have to be done. It's Sunday night and we close tomorrow. We are going to go over the final paperwork with our mortgage dude in the morning, pick up a giant cashier's check, and then we go to sign our lives away. Hopefully it won't take too long so we can grab lunch before I have to run to my night class. We ran a few errands today and tasted some smoked turkey at the bbq place that is literally across the street from us; it was really flavorful and delicious. 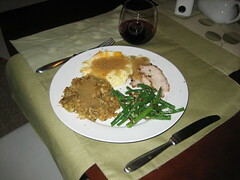 We decided we'll pick up turkey there on Wednesday night and then make our own sides on T-day. We're thinking mashed potatoes, green beans, and pie for now. It will be really nice to celebrate after officially getting the house and me completing some final presentations. We did the final walk through today! We close on Monday! No surprises and we played around with fabric swatches and paint chips; the sectional couch will be "walnut" and the walls are currently looking like they'll become "Hazel Woods" whatever that means. Austin and I also did a little more exploring in the area. We have a Walgreens and Wells Fargo very close by as well as a cute little market with a nice deli. There is a great Mexican joint where we will take any and all visitors to experience the classic Austin tex-mex breakfast of "migas" (eggs scrambled with tortillas, onion, beans, salsa, delish!). There was a cute coffee shop, we also discovered the local and amazing Thundercloud Subs, and we found our neighborhood Radio Shack [more important for one of us, can you guess who? :-) ]. That, and there is a a close by grocery store and a Super Target along with Home Depot. Ah, suburban bliss! As I'm typing, Austin just randomly said, "I'm really excited about people coming to stay with us!" 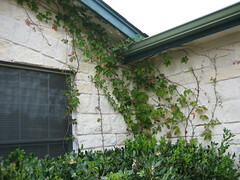 We both are looking forward to guests and hope that (if we know you and you're not an internet troll reading this blog) you will consider a trip to Austin and a stay at Hotel LundeRoy. Austin and I are so excited to do the final walk through of the house tomorrow. We have a few fabric swatches for the couch and paint chips for the walls to bring in with us. 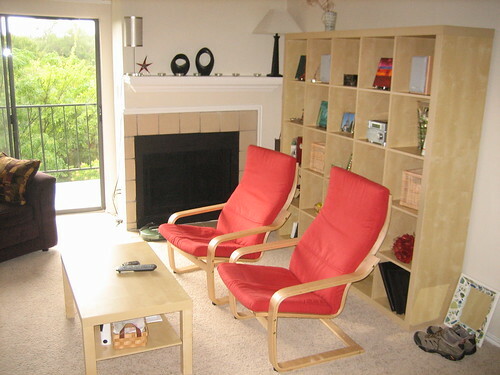 Very soon we can order our sectional sofa and appliances and get a move date on the calendar. Besides that, I'll be working on two final presentations, administrative teaching stuff, and maybe, just maybe, I'll even start a final paper. Big ambitions but we go Home for the Holidays in 26 days so it's gotta get done. As for tonight, we went out for dinner and are now staying cozy inside as the "polar temperatures" continue in Central Texas. Polar here means 30s/40s/50s. We're ok with that being the cold standard. I can't believe how fast the days are flying by and it gives me that feeling of wanting the semester to be over but wondering how all the projects, papers, grading, etc. will manage to get done. We were originally set to close this Friday but the date was changed to Monday. It worked out with my class schedule so I agreed to the change, not realizing that I have a final presentation in my Monday night class as well as another presentation in my Tuesday morning class. Oops. But... then I'll be off the rest of the week for Thanksgiving! Speaking of T-day, Austin and I had hosted my family for the past couple of years and really got into cooking for a group. This year will be our first Thanksgiving as just the two of us. We really wish we could pull it off in the new house but we won't be moved in by then or have a refrigerator which would be key for the event. 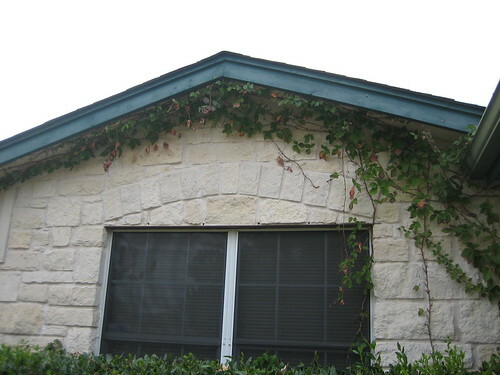 Anyway, it'll be a good way to say farewell to our little apartment where we first settled in as Texans. Yesterday the high was in the mid-70's and it was a gorgeous day. 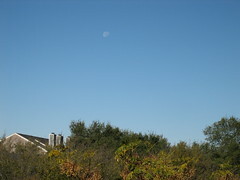 The forecast indicated it would get windy and a cold front would move in. They were not kidding! I thought our apt building was going to blow over last night. I had to put in ear plugs to sleep because the windows kept rattling and other parts of the building were creaking and groaning. I woke up to 47 degree weather, just a few degrees warmer than the reported 40 degrees in Wisconsin. I was also interested to see that both a frost warning and fire weather warning were issued for our area, kind of reminds me of that "heat/defrost in the morning, a/c on the way home" way of life in MN/WI. The high today should get up to about 60. This will be good weather for staying in and drinking lots of tea and studying. Austin will enjoy gaming today. We do love the Great Indoors. We're officially going to be homeowners two weeks from today! We're not sure when the big move will happen but I'll be sure and update everyone on the new address; most of you know how much I love getting snail mail. We are also excited to have guests, the Hotel LundeRoy awaits your reservations. Fall is definitely my favorite season but it's always bittersweet because I detest winter, all six months of it as it seems sometimes. Anyway, it's been a transition to see what fall is like here but the end of October and November so far have been amazing. We sleep with the windows open and wake up to crisp mornings but by the end of the day, it's sunny and in the upper 70's (sometimes unseasonable 80's). The leaves don't change as dramatically here, again something I miss, but they're bright yellow and the sky is vivid blue almost every afternoon so it's still got an autumn feel to it. My friend Sharon and I decided this year to exchange autumn gifts instead of birthday presents. Sharon has a lovely, sensible June birthday but mine is an unreasonable December date coinciding with the Christmas/Kwanzaa/Hanukkah/Winter Solstice/New Year/Everything holidays. 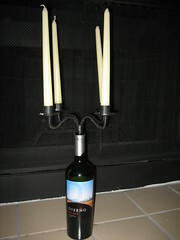 Anyway, Sharon sent me a very cool wine bottle candelabra that also comes with the added incentive of getting a really nice bottle as an excuse for making the perfect candelabra base. It's a little hard to describe so I'll let the picture be worth a 1000 words. Another thing I enjoy about this time of year is cooking. 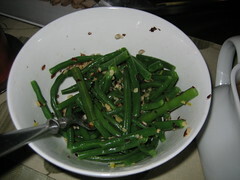 Austin and I hosted Thanksgiving a few times when we lived in EC and loved practicing different side dishes. 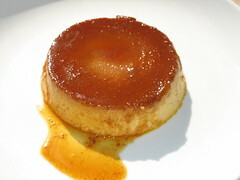 One thing I always wanted to perfect was a pumpkin flan since I had one years ago that was so good, I still think about it. 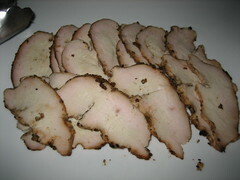 I never found a recipe that worked and this past weekend, tried one from Cooking Light. 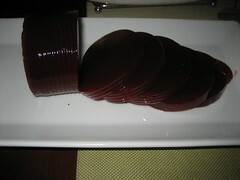 It was a flan flop once again! However, it looked delicious. 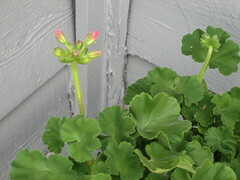 My last autumn note is that the geranium that our neighbor left us upon moving is starting to blossom- in November! This seems to be a good trade off for the hot summers. YES WE CAN (go blue)!